Snow cones are deliciously, refreshing and a great way to cool off during the long, hot days of summer. With our five bottles of �pick your own� snow cone syrup package, you are prepared to make homemade snow cones throughout the summer season. The lazy days spent at the pool, beach or park are even more special when you serve delicious snow cones to everyone. Our package featuring five quarts of shaved ice syrup ensures everyone enjoys their favorite flavor. When you have five bottles of �pick your own� snow cone syrup, it�s like your own personal snow cone cart. One of the most fun parts about snow cones is the ability to create your own flavor combinations. Looking for a fun, summer activity to do at home? Our five quarts of shaved ice syrup means everyone can explore and discover their favorite flavor combinations. 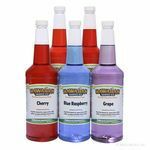 When you have five bottles of �pick your own� snow cone syrup, the delicious combinations are endless. 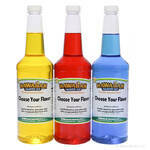 Our five quarts of shaved ice syrup package also saves you 20 percent off the price of individual bottles. Check out our entire single quart size flavors available.